S0710. 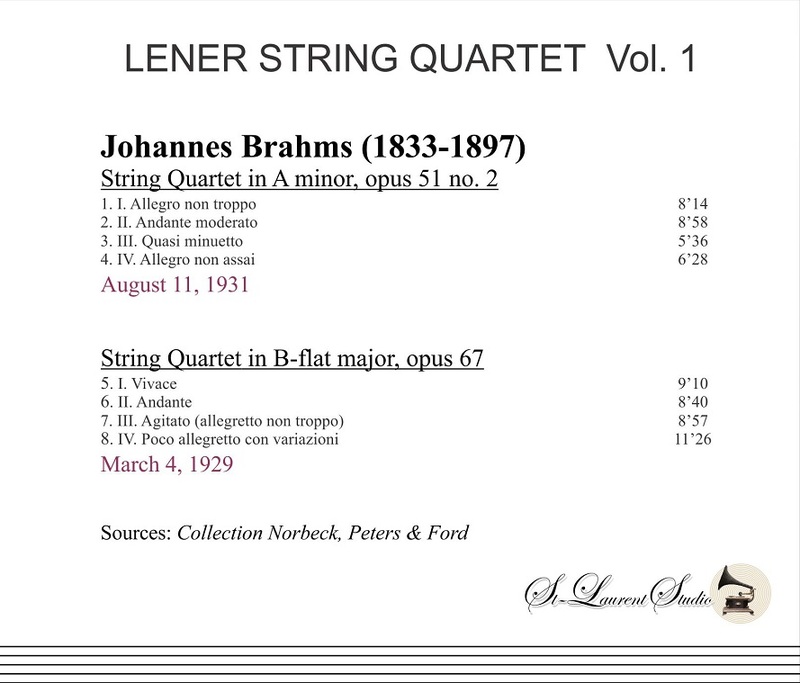 LENER QUARTET: Quartet in a, Op.51, #2, recorded 11 Aug., 1931; Quartet in B-flat, Op.67, recorded 4 March, 1929 (both Brahms). (Canada) St Laurent Studio YSL 78-634. Remarkably quiet transfers from the superb Royal Blue Columbia Shellac 78s by Yves St Laurent. This is the first in that which will be a monumental series of Léner Quartet CDs produced by Yves St Laurent! "The best thing about this release is that on the disc it says: 'Léner Quartet, Vol. 1'. That means more is coming, for which all lovers of chamber music should be grateful. 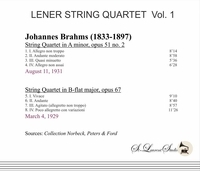 The Léner String Quartet was founded in 1918 by Hungarian violinist Jeno Léner , and the original four members (Léner plus Josef Smilovitz, Sandor Roth, and Imre Hartmann) remained together until 1942, when apparently a conflict erupted because LÃ©ner wanted extensive rehearsal before performances of their scheduled Beethoven cycle in Mexico City. The other members objected that after decades of playing those quartets, extensive rehearsal was not needed. For almost a quarter-century before the breakup, the Léners rivalled the Budapest Quartet in international fame. To them fell the honor of making the first complete recorded cycle of the complete Beethoven quartets. Unlike today's world, when such a project would be done quickly, this enterprise spanned from 1926 to 1938. The Léner discography is extensive. They recorded, in addition to the Beethoven cycle, the three Brahms quartets (as well as the quintets with piano and clarinet), the Debussy and Ravel quartets, and works by Mozart, Haydn, Schubert, Schumann, and Dvorak. In 1929 the Columbia Gramophone Company presented them with a golden record, honoring the sale of the millionth Léner recording! Ravel heard them and liked their playing so much that he personally coached the Léners in his quartet and urged them to play an all-Ravel program. There is undoubtedly something quite old-fashioned about the way the Léners play, with a varied but heavy use of vibrato, considerable portamento (sliding from one note to another), a strong use of rubato, and extremes of dynamic shading. Some modern listeners will object that the playing is too free, but to others it will be the kind of deeply-felt, highly personal music-making that has sadly disappeared, for the most part, from our concert stages. As you might guess, I fall into the latter category. The present recordings of the Brahms Quartets Nos. 2 and 3 were made in 1929 (Op. 67) and 1931 (Op. 51/2), so the group had already been together for more than a decade. By this time they were masters at matching sounds and colors. Daniel Barenboim once said that an ideal orchestra must play as if with one pair of lungs and one heart. This is precisely the impression one gets from the Léners here. The blending of sonority in the two slow movements is miraculous. The way that they feed each other phrases is a perfect example of musical give-and-take. If you try to listen analytically, you will realize that an incredible amount of thought and experience must have gone into the level of musical communication going on throughout these pieces. However, it is nearly impossible to listen analytically because of the captivating ebb and flow of the performances. To me, this is quartet playing of almost indescribable beauty. That St. Laurent Studio is making at least a part of the Léner Quartet's discography available to a wider public is cause for rejoicing. The transfers are very good, with whatever surface noise on the originals reduced or eliminated while retaining the full range of color produced by the group. There are no notes, just track listings and documentation of original recording information. The disc is available at Norbeck, Peters & Ford (norpete.com). It is an early candidate for my FANFARE 'Want List'." 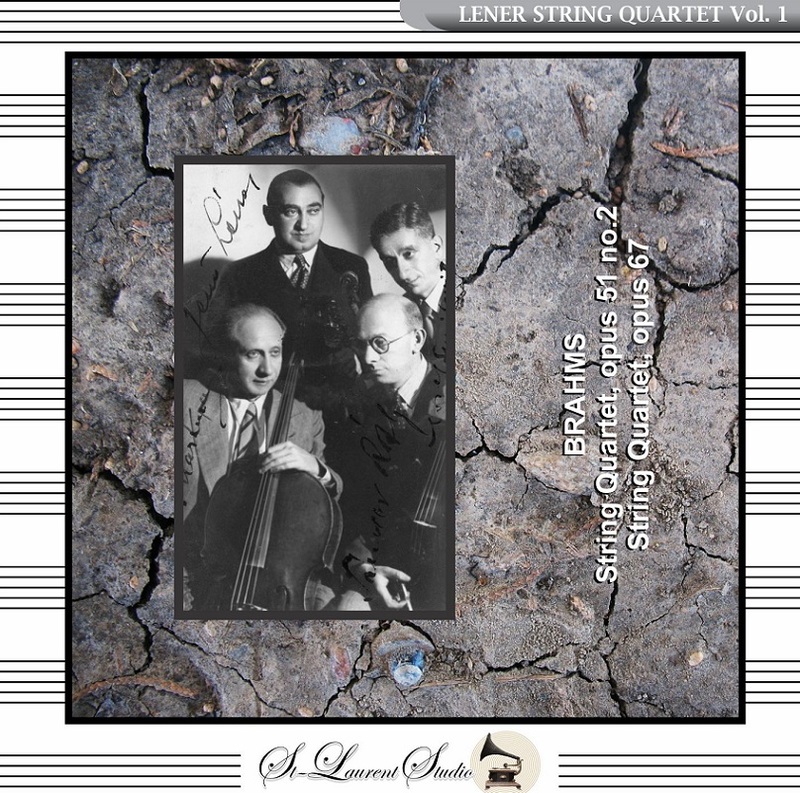 "The Léner Quartet enjoyed one of the great recording careers, lasting from 1922 to 1939 and involving distinguished guest artists: pianist Loeser-Lebert, hornists Aubrey and Dennis Brain, bassoonist Hinchliff, oboist Goossens, clarinetist Charles Draper, violists d'Oliveira and William Primrose, and bassist Hobday. The Léner legacy is a collector's dream."